We would like to take this opportunity to introduce you to our company, with over 15 years experience in the design kitchen industry, we feel we have expertise that matters. 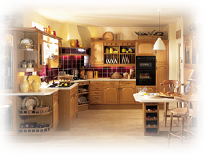 Our experienced staff are constantly designing new styles and ranges, always at the forefront of new kitchen technology and dedicated to providing quality kitchens at very competitive prices. Our range is highly diverse, we constantly introduce new styles as the world of interiors is continuously changing we try to remain product leader at sensible prices. All these styles of kitchens have proved to be popular with the consumer and are always available as well as the new ranges. Kitchens are us are a member of the Consumer Protection Association. The Consumer Protection Association is an independent body offering a range of services designed to offer the purchaser of home improvements valuable protection.